Neck Pain Chiropractor Minneapolis | Chiropractic Treatment St. Paul | Moua-Lor Chiropractic & Acupuncture, P.A. Neck pain is a major issue for which chiropractic care has become common. There are millions of people who have to struggle with neck pain every year. 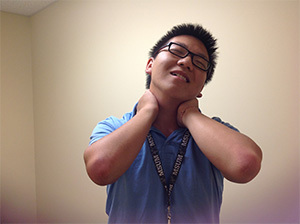 Neck pain can range from barely noticeable, to intense pain that makes it difficult to move. Chiropractic care is a very effective way to relieve that pain. Chiropractors are trained in the anatomy of the neck and spine. It is a chiropractor’s job to understand the way the spine and neck function in order to keep them properly aligned. There are a lot of causes of neck pain. These causes can be something minor or something more severe. Chiropractors help relieve many types of neck pain through spinal manipulation. They do this by keeping the spine in proper alignment so that the body can function as intended. This will also help to reduce pain in the body. The world we live in today includes lots of driving or sitting at workstations. This results in poor posture which can misalign the spine and is one of the largest causes of neck pain. In addition to spinal manipulation chiropractors can recommend exercises to patients and give out other tips to reduce the risk of neck pain re-occurring. If you are struggling with neck pain then chiropractic may be the answer for you. Give us a call at 612-529-0202 to set up an appointment today.